APE is short form for Monkey’s Audio, a audio codec for for lossless data compression of digital music. Apple Lossless, also known as ALAC (Apple Lossless Audio Codec) is also a compressed lossless audio format developed by Apple Inc.
APE audio files are not natively supported by Apple Mac and Apple devices, to play Ape on Mac or import to Apple devices without any quality loss, we will need to convert APE to Apple lossess ALAC audio format. This article will guide you step-by-step to convert APE to Apple lossless ALAC for easily play APE on Mac, import APE to iTunes and transfer to iPod, iPad, iPhone. 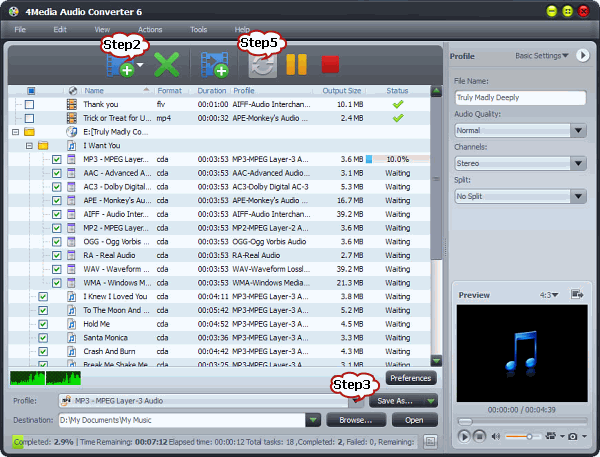 4Media Audio Converter is a powerful APE file converter for APE conversion. It can convert APE to Apple Lossless ALAC or Apple loss M4A, and convert APE to other lossless audio like AIFF, FLAC and WAV, convert APE to any other audio formats, as well as convert between all popular audio formats. In addition, with APE to ALAC Converter, you can merge, trim, split APE audio files, adjust audio bitrates, quality and volume to customize output audio and more. Click “Profile” Drop-down. From “Lossless Audio Format” category, choose “ALAC – Apple Lossless Audio Codec(*.m4a)” as the output profile. Click “Browse” to specify the destination folder. If your APE files is a single APE file containing album of songs, you may want to split the long songs to separate songs. If you have a CUE file attached with the APE file, you can split the APE file based on the CUE file with APE to Apple Lossless Converter. To split APE files with CUE, in the task list, select the APE file and right click the mouse (Widows user) or press Ctrl and click the mouse (Mac users) to open the context menu. Click “Split by Chapter” in the context menu in the task list. The APE files will be automatically split to separate tracks. Click on “Convert” button at the bottom of the Converter to start APE to Apple Lossless conversion. It is just that easy to convert APE to Apple Lossless audio with the smart APE to Apple Lossless Converter. Once you’ve finished the conversion, you can add the converted files to iTunes, sync to iPod, iPhone, iPad to enjoy the incredible quality music that lossless audio codec brings to you. Mountain Lion AC3 Support: How to Get AC3 Supported on Mac OS X 10.8? Convert 6 channel AAC/WAV/DTS to AC3 5.1/Stereo on Mac or Windows?